Stacking the Bricks: Guest Post! How Austin Church creates evergreen content, step by step. Guest Post! How Austin Church creates evergreen content, step by step. Every aspiring product creators needs to commit this memory. Forget your nifty app idea, or your cute guide to making sourdough bread while blindfolded underwater. Look for painful problems. Look for starvation. I once had a nifty app idea. I stumbled bass ackwards into my first product that people bought. It was a stupid photo booth iPhone app called Mustache Bash. It could… drumroll… put mustaches on photos. In its first year the app made about $8,000 in the App Store, which sounds okay until you consider that I spent $4,200 to develop the first version. Not exactly a cash cow. The real breakthrough came a year later. Over sushi, with my friend Ryan. Between bites, Ryan told me about his dream the night before, where I had turned the Mustache Bash source code into a product and begun licensing it to other iOS developers. 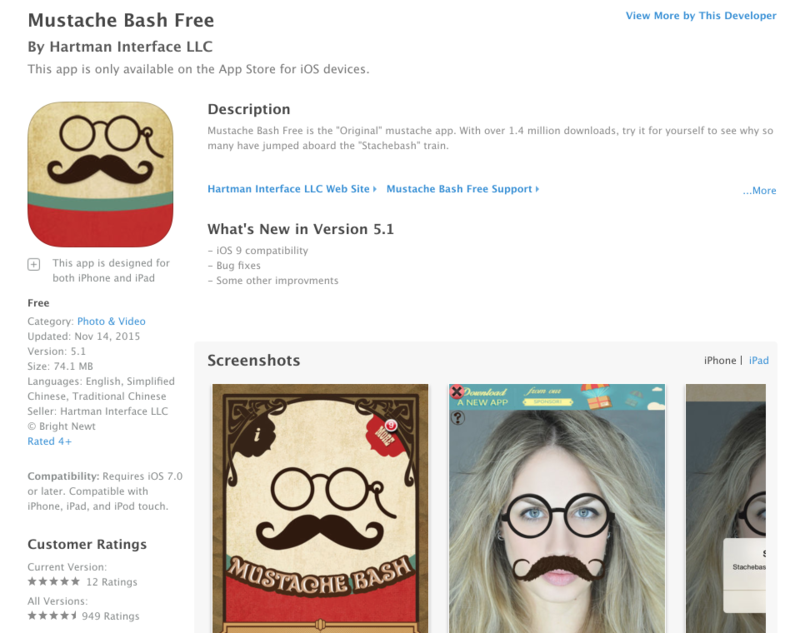 I took Ryan’s dream as advice and paid my iOS programmer to create a step-by-step tutorial for using the Mustache Bash code in other apps. Then, I reached out to another friend, Carter, who agreed to promote the Mustache Bash product to his list of app developers. Carter sent two or three emails over a weekend. Those emails generated $20,000 in sales. The source code made more than 2x than the app itself ever did, just in the first weekend. And wow. An inbox full of PayPal transaction emails was habit-forming. That experience involved a bit of luck (Ryan’s dream, and my relationship with Carter). But it demonstrated for me the power of Gary’s advice: Sell to a starving crowd. That is, a large number of potential customers with a painful problem and money in their pockets. How could I reproduce the experience? And what if I didn’t have access to a list like Carter’s? I stumbled across an early demo of the 30x500 Sales Safari process a few years back. After watching Amy work her magic, I was finally able to connect the dots between Halbert’s starving crowds and my desire to create more products. No more going with my gut. Amy and Alex showed me a repeatable process for finding my starving crowd using Sales Safari. What is the point of a Sales Safari? To find starving crowds and pinpoint their most painful problems. A number of smaller problems typically choke the path to the bigger, hairier problem, so you make it your business to give those smaller problems the machete treatment. You teach to elevate. You solve to sell. Not only are you building an audience, increasing your leverage—along the way, but you are also removing friction from the buying process. Once you have gained people’s trust by solving smaller problems, you can offer your remedy to their bigger problems. Personally, I’ve been growing my audience over the last two years by serving them. And how have I been serving them? By writing reeeeeeeeally long, comprehensive blog posts that address the problems I find using Sales Safari. You too can stack the deck in your favor by figuring out what topics are already hot and trending. You can poke around online, pick up clues, and write your version of an authoritative post on a given topic that is relevant to your target audience and product roadmap. Let me show you exactly how I do that, in 17 incredibly detailed steps. 1 I create a new Google doc for my notes. I will give my doc a title like “Freelance Writer Research” and start filling it up with notes from my Safari. This is the vault where you will store your wealth. I like to make my life a little more pleasant by adding section headers as I start to see the same questions and problems appear over and over again. 2 I find my audience’s forums and Facebook groups. 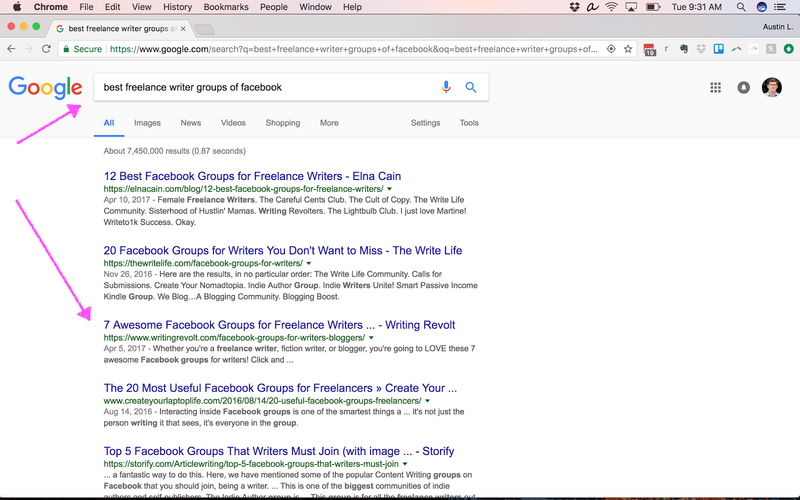 One weekend, I spent hours combing through forums and Facebook groups devoted to my audience: freelance writers. The easiest way to find such “watering holes” is with some Google fu. Duh. You can find Facebook groups the same way. Double duh. 3 I Compile a list of common problems. 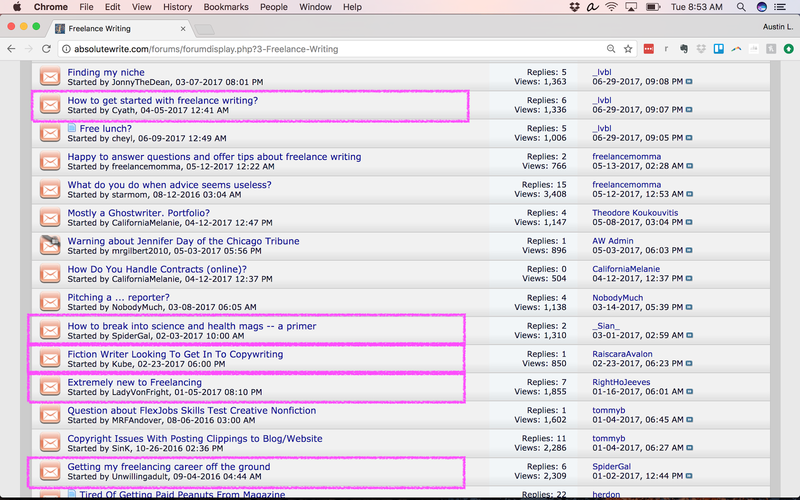 I go out of my way to copy and paste the links to discussions and forum posts as I find them. I capture comments, and the content itself. I capture the other members’ responses, too: the advice they give and links they share. If you’re anything like me, you will add your own commentary and notes as you go, but I’m careful to preserve the original wording. The best messaging for a premium paid product or even a free educational blog post comes straight from the horse’s mouth. When I stumble across the perfect turn of phrase or analogy, and I’ll poach it. In my experience the language that people use to describe their own problems, while they’re still in the middle of them, is simpler and more visceral than the copy that we product creators write. Talk about striking gold! So I have become fanatical about not messing with a good thing. For example, aspiring freelance writers ask these obvious questions about how to get started. Gold, people. This is gold. I can use this stuff verbatim later in my sales copy, in my blog posts and their titles, in my emails and their subject lines, and in my Facebook posts and tweets. Despite the dozens, if not hundreds, of posts, most people in my audience share the same core issues or challenges. We’re talking 10-12 main problems, not 100. Several groups comprise my target audience. Seekers – Dissatisfaction with a 9-to-5 job leads to a side hustle. Hustlers – That side hustle (or another one) blossoms into full-time freelancing. Lifestylers – Once freelancing income eclipses 9-to-5 earnings, a new goal takes shape: using surplus funds to make lifestyle upgrades (or downgrades). Diversifiers – A growing dissatisfaction with selling time for money sparks an interest in passive or residual streams of revenue, including products. The point is, different subsets of my audience will want and need different knowledge, training, and tools. Noticing this is useful because I can be even more focused on the pains of each subset. 4 Pick a problem that comes up over and over. At this point, you may have noticed a pattern in my own research. I will pick a single overarching topic and then compile a long collection of specific fixes. My cornerstone posts aren’t cotton candy posts with no real substance. I go beyond recommendations and give homework. I get detailed, giving step-by-step instructions for what freelance writers should think about and do. By all means, do what works. Listiles can work. Publish some listicles. But be sure to intersperse the lite bites with main courses as well. I try to be Luke’s Yoda. With every post I’m striving for deeper, more detailed, more thorough, more advanced. And for the love of all that is sparkly, don’t forget to have some fun. 5 I create a new doc for the new post. 6 I use BuzzSumo to find several good title options. The title is the hook required to get people to read this really helpful content. 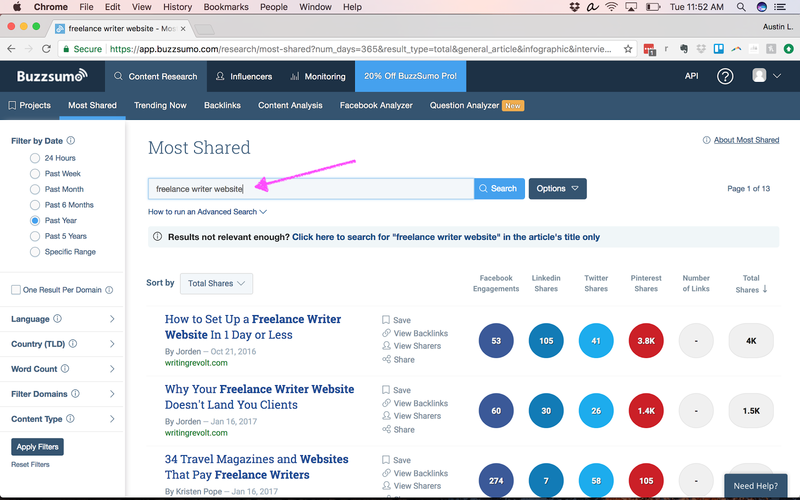 BuzzSumo is great for finding relevant headlines based on the keywords for which you search, as well as the total number of social shares for each one. I copy and paste the best title options I find to the top of my otherwise blank new doc, along with the links to “competitor” blog posts I’ve found for reference. Sidenote: this Buzzsumo approach works for coming up with formats and concepts, too. If I notice that listicle blog posts are doing well, then I could create a longer, more comprehensive, “definitive” edition that people are more likely to use and share. 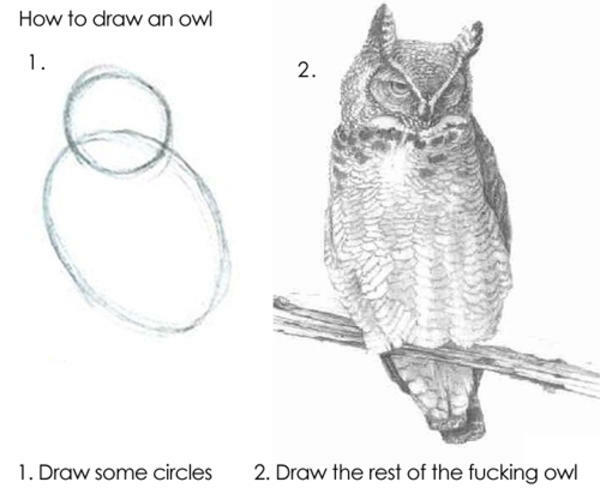 If tutorials or really deep how-to guides get the most shares, then choose that format. 7 I use Ubersuggest.io, AnswerthePublic.com, and Quora to fill in gaps. I may have the core pain from my audience — e.g., “how do I set up a freelance writer website? ” — but I haven’t necessarily found all of the different “angles” to include with my advice. Ubersuggest, AnswerthePublic, and even Quora can help figure out what the “related” problems are, which I use to create additional sections in the draft of my new post. The goal here is to develop a Table of Contents for your blog post. If you touch on all of these areas and give solid advice, then you will have done a major service to your target audience. 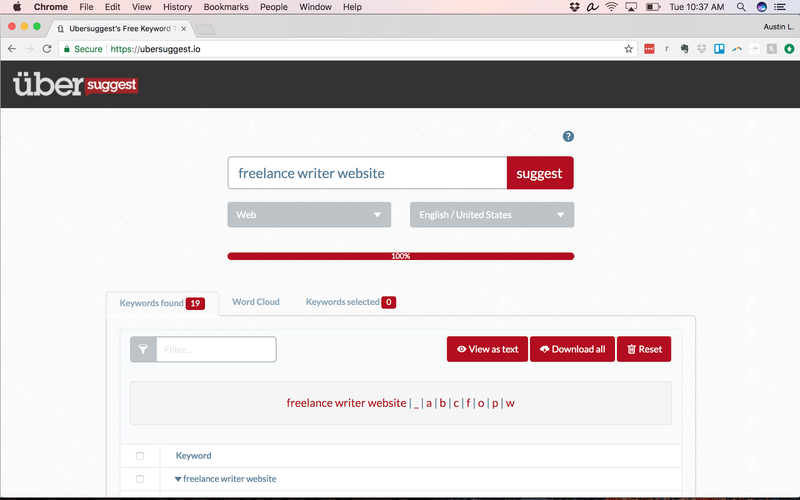 For example, when I ran a search for “freelance writer website,” Ubersuggest.io returned 19 associated keywords. What content should go on your freelance writer website? Can you use a template or should your website be custom? Is WordPress the best platform for freelance writer websites? In other words, I use the three websites mentioned above to make my posts more complete and thus more helpful to my readers. Finding and scanning “competitor” blog posts can serve a similar function. 8 I write my Introduction. At this point I usually have a sprawling mess of unedited content and ideas. I’ve got to get people into the topic somehow, and quickly. Intros should grab attention, hook a reader, and make them hungry for definitive answers (finally my pain will be solved!) to the questions that have plagued them. The intro needs to get the reader’s attention and tell them what they’re going to learn. The best way to do this is to bring the problem to the forefront and give some assurance that you will help your readers solve it. I like to share a story, stir up emotion, and show my readers that I get them. You will revisit your thesis throughout, and the various sections will support and enrich it. Finding the thesis first will save editing time later. But if you’re anything like me, you sometimes need to write to figure out what you think. Your thesis may not appear until you’ve written 300-400 words. You can always cut later. 9 I write the rest of the post. Write at the same time each morning. Write for only fifteen minutes at a time. Write in the same place. Listen to the same music. Use the same writing app. Write from the heart, not to sound smart. Have some friggin’ fun already. If I can’t write, I talk. Open a new voice memo, and use the process in this post I wrote about beating writer’s block. 10 I link out to and disagree with other experts. I know that other freelance writers have obviously picked up on the challenge with setting up a website because I found tons of blog posts on the subject. One freelance writer with a large following on Pinterest wrote about how you absolutely, positively must put your call-to-action above the fold. This seems like good advice. I agree that using a single call-to-action on your Home page is smart. But I decided to do a bit more research about the best placement of that call-to-action. Sure enough, I found evidence that the importance of “above the fold” is greatly exaggerated and what really matters is writing strong copy that makes people want to take your desired action. I remind myself that even people with good intentions give bad advice, so I owe it to my audience to use solid research to build my case. With that view in mind, writing an authoritative blog post about how to create a freelance writer website felt less like an exercise in audience-building and more like a professional obligation. 11 I write the conclusion. Some people recommend writing the introduction and conclusion at the same time, but I prefer to wait. Often, while I’m producing the meat of the blog post, my thesis will evolve. I’ll need to go back to the introduction and adjust it. By the time I write my conclusion, I have drawn a circle around the blog post’s main thrust, and I can get it right the first time. Whatever the case may be, a conclusion has two pretty simple jobs: 1) to tell people what you’ve just told them, and 2) to tell them what you want them to do next. Give me your email address and get this free content upgrade. Wire $15,000 to my account in the Caymans. Please. 12 I add some images. I use Creative Commons and Unsplash to source free, royalty-free, license free, commercial usage images. 13 I find 2-3 good keyword options (with some help). I’m glad that I took the time to do some “light” keyword research… and then paid an SEO specialist to send me the best keyword options for my 10-12 cornerstone blog posts. He pays for the best keyword research tools. He spends his days (probably nights too) staying abreast of the latest changes to Google’s algorithms and best practices. He frees me up to play to my strengths. I need to target good keywords in my blog posts, but I don’t need to be the one doing the research. DISCLAIMER: Amy & Alex reminded me that SEO can be a huge distraction, not to mention an adventure in missing the point. Plenty of people are meticulous about this stuff yet only write a post every once in awhile. They never see results. Don’t shoot yourself in the foot with SEO. You must prioritize primary activities (e.g. publishing your way into people’s trust) over secondary activities (e.g., optimizing blog posts). If I had it to do all over again, I would ignore SEO until I had 10-12 cornerstone blog posts and a complete marketing funnel in place. SEO is the furniture polish. 14 I optimize the post for those keywords. The Yoast SEO plugin for WordPress simplifies this process for me, and this start-to-finish guide from Moz.com will get you up to speed (if you use WordPress). If I were you, I’d take a little bit of time to create an SEO-related checklist similar to this one from Hubspot. That way, you don’t have to remember all the to-dos from post to post. DISCLAIMER: Do not, I repeat do not, shoehorn keywords into your blog post. If the fit isn’t natural, ditch the keyword. Otherwise, your post will read like a how-to manual vomited by a robot. Confusing your readers with weird word choice and awkward sentence structure—to better accommodate keywords—won’t win their trust. Besides, Google actually penalizes this practice now. When in doubt, make your content easy to read and simply ignore keywords. 15 I publish my imperfect post. I am a professional writer. I have a BA in English, an MA in Creative Writing, and a decade of experience writing for clients who pay me. I have never published a perfect post. Most of my posts have some noticeable blemish: a grammatical error, scrambled verb tenses, a typo, a rough transition, or even a soggy thesis. I push them out into the world with regularity. Since I started two years ago I have averaged at least one blog post a week. I’ve got 120 stories on Medium and many more in my queue. I have made writing my life, and yet I still embarrass myself daily in the public forum. Legions of trolls can salivate over my ineptitude! Captains of smugness can send their emails and leave their comments. I can thank them for their time and rest secure in the knowledge that Consistency. Trumps. All. Things. Perfectionism is paralysis. Don’t let perfectionism rob of the real treasure: consistency. Perfect performances never made a single career. Get your post to a “good enough” state. Then, publish it. Then, promote the scatological reference out of it! That’s what will really move the needle for you. I still find warts in them. Even so, my efforts are paying off. 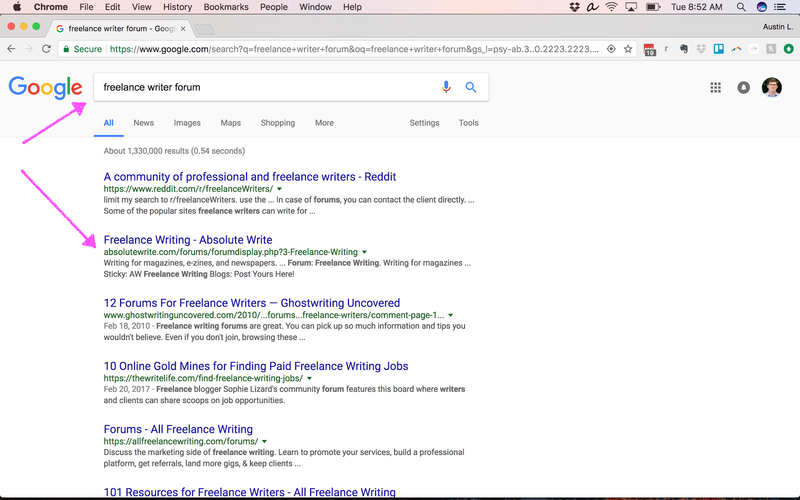 Last time I checked, my freelance writer website post ranked #1 on Google. 16 I offer a content upgrade. Checklists, questionnaires, cheatsheets, and templates convert the best for me. I’ve just created a ton of value for people with a deep, cornerstone blog post. What else can I offer, in exchange for a reader’s email address, that will help them to implement what they have learned more quickly? I put that advice or support in the form of a content upgrade. I add the opt-in form at the end of the post using ConvertKit. 17 Promote your blog post. Your beautiful, helpful new blog post is a house in the woods until you actually drive some traffic to it. Content marketing is a BIG TOPIC. Start with this 30x500 video on how to promote in a respectful, non-spammy way. What has surprised me about my findings from my Sales Safari is how basic many of the problems and questions are. 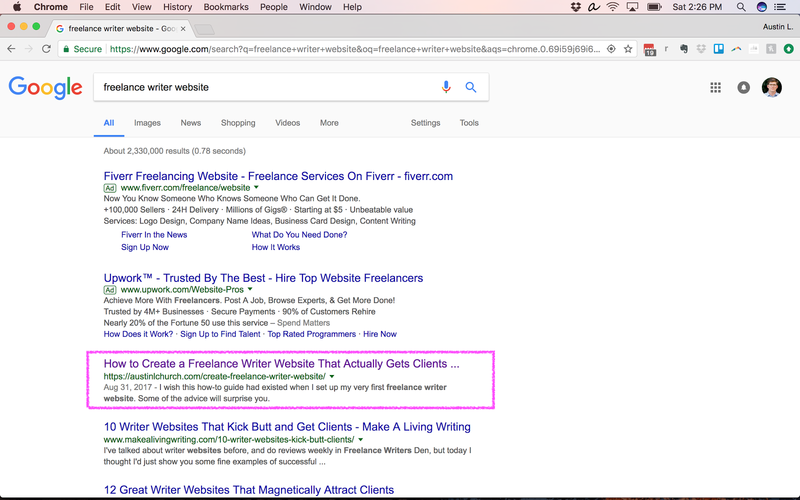 Without first doing Sales Safari, I would never have thought to write a really deep post about a freelance writer website because all of those questions haven’t been on my radar FOR NINE YEARS. It’s easy to forget what it’s like to not know what you know now. That’s why a Sales Safari is a must. Deep research reconnects you to the minds and hearts of your target audience. You can catch your would-be customers in moments of transparency and vulnerability. You can then earn their trust by solving painful problems. What that has looked like for me is writing long, deep, authoritative blog posts for each one of the 10-12 topics around which MOST forum posts and Facebook comments orbit. I am a writer, so teaching what I know through blogging is a natural fit for me. You can also put out YouTube videos or start a podcast. Regardless, I hope you will first cultivate Gary Halbert’s one advantage and gather definitive proof of a starving crowd. Feed them, earn their trust, and then you can sell products. Do you want a free checklist to use for your next blog post? I distilled this post down to a free checklist that you can keep beside you when you’re working on your next post. Click here and enter your name and email address. I’ll send it to you the download link.